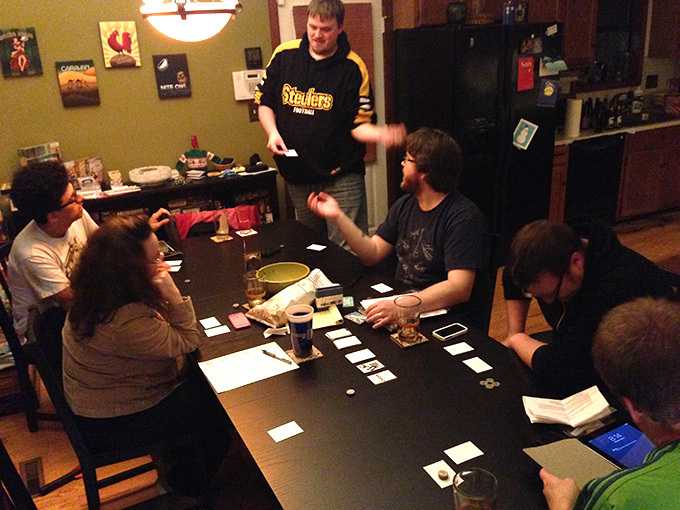 The call for card games from Dice Hate Me was heeded – in a very big way! We received over 100 entries into the Dice Hate Me 54-Card Challenge, which was far above and beyond expectations. The massive amount of entries meant that the design community was energized and inspired to create something special, but it also meant that the competition was fierce, and judging took a very long time. Originally, the plan was to have six finalists to be judged at Unpub; since there were so many great entries, we’ve decided to narrow the finalists to 15! These 15 games are to be played by independent play testers, designers and various judges during the Unpub 4 festivities this weekend. I’ve been documenting the playing and culling process since the beginning of the competition, and I’ll be documenting the selection of the final winners with photos, notes about individual play tests, and audio commentary for the State of Games podcast. The official winner, as well as first and second runner up, will be announced within about a week of Unpub 4. 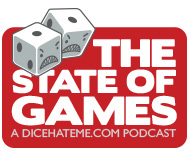 Stay tuned to Dice Hate Me and The State of Games for the winning announcement. Below is a list of the 15 finalists – the game name, the designer(s) responsible for its creation, and a brief description of what the game is all about. If anyone happens to attend Unpub 4 this weekend, stop by the registration table, check out a game that interests you, give it a play, and then record your thoughts. With your participation, you can help the judges decide the winners! Easy Breezy Travel Agency – Designer: J. Alex Kevern – Sheboygan, 1974. Frozen Wisconsinites are aching to escape their frozen winter homes! It’s your job to aid the ice-bound citizens escape to Chicago, New York, Miami, or New Orleans in this easy-to-play card-drafting, set-collection, press-your-luck game! Heroes & Olympians – Designer: Nick Sula & Spiro Dousias – It is the time of gods & men, a time when the ancient Greeks called upon the powers of the denizens of Olympus to aid them in epic feats. Take on the mantle of one of the Olympic heroes as you endeavor to accomplish great labors in this small but robust deck-builder. Beat It – Designer: Jed Humphries – It’s a quiet night at the restaurant, which means the cooks can compete for the title of master chef! Manage your hand of entrees and action cards, always trying to one-up the next cook or con them into letting you continue. Will you serve the last, best meal, or will you burn out and be asked to beat it? Human Resources – Designer: Nathaniel Levan – It’s cubicle chaos! Help the human resources department at your office rearrange the employee work space for either efficiency or their own nefarious purposes. With elements of hand management, spatial puzzling and second-guessing your opponent’s true intentions, this two-player game will keep you wanting to work for the man over and over again. The Lucky Penny Diner – Designer: Stephen B Davies – Working in an everyday diner has its perks – regular customers and zero excitement. But that also means you have to be on top of every order. Manage your hand of appetizers, entrees, drinks and desserts as you serve several customers with certain special requirements over a couple days time. Odd Socks – Designer: John du Bois – Have you ever wondered why you seem to lose a sock every time you do the laundry? This game won’t answer that question, but you will do your best to figure out the lone sock without a pair in this quick-playing deduction game for 2-6 players. Penny Farthing Catapult – Designer: Daniel Solis – It’s time for battle! Don your leather helmet, mount your Penny Farthing, and get ready to hurl classic works of art, wigs, rubbish and fruit at your other combatants. Isle of Trains – Designer: Dan Keltner & Seth Jaffee – Build the best train line and complete delivery contracts to become the best train operator in this engine building, resource management game on the Isle of Trains. Jack & The Giant – Designer: Dan Cassar – In this two-player card game, one player takes on the role of Jack who is trying to steal the treasure from his opponent, the Giant, who is doing his best to capture him before he can run off with his gold, his harp and the goose that lays the golden eggs. The Fittest – Designer: Graham Russell – You’ve been selected for the most rigorous, cutthroat reality competition on TV! As a contestant, you’ll compete in challenges and work with and against the other competitors for a shot at the grand prize of fame and fortune. You won’t win if you go it alone, but you’ll have to do a bit of backstabbing to emerge victorious. Diner! – Designer: Matthew O’Malley – The waiters at your friendly neighborhood diner have a friend competition going over who will make the most money on tips tonight. The kitchen is short-staffed, so the chef is cooking every meal on the menu as quickly as possible and is counting on the waiters to get the right food to the right tables. This fast-paced card game will keep most any short-order chef entertained with simultaneous plays and non-stop action. Memory Knights – Designers: Erik & Chris Gillespie – Memory Knights is a memory card game for two to six players. Each player is placed in the seat of a commander choosing champion knights to fight off a series of monsters. Amidst the chaos of battle, a commander can only rely on his memory of the army’s composition in order to choose the knights best suited for the fight. The player with the best knights will claim victory over the challenging monster! Tinker, Tailor – Designer: Jason D. Kingsley – In this game, players attempt to claim goods with roles and use the goods to purchase buildings over the course of three rounds. Each player has an identical set of eight Role Cards, each with special abilities that can influence other role cards and the goods cards in the field. Tinker, Tailor is a game filled with cat-and-mouse reactions, resource management and action optimization. Frozen Fruit Frenzy – Designer: Benjamin Chhoa – The Fraser Frazzle’s Frozen Fruit Factory is on the fritz! All the ingredients have been separated so there’s no way to tell what’s in each bag. Thankfully, Frazzle will accept returned product for credit! As a smoothie shop operator, you can bid on the best bags and turn the ingredients into delicious smoothies that earn you points to become the most popular shop in town. Corruption – Designers: Matt Riddle and Ben Pinchback – It’s a tough world out there. Lots of twists, hoods, redhots.. and that’s the good guys! In this noir-based thriller, players use a set of 5 identical action cards to secretly tamper with a location or openly investigate a crime, all in an effort to best achieve the rotating goal cards from round to round. Use your actions to tamper with the evidence, influence the investigation, deduce what the other opponents are doing, and solve the crime of the decade! Dice Hate Me Loves Card Games! Dice Hate Me Games Brings You New Brews, Beer and Belles for 2013! Any way we can get any feedback on the ones that were not selected? Congrats to all the finalists. Good luck to you all getting your games into player’s hands.